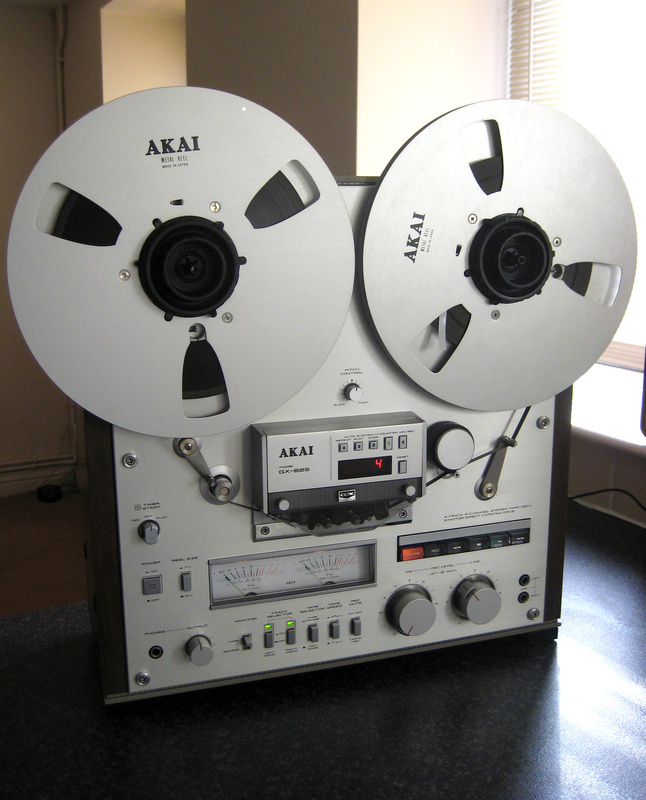 Back in the nineteen seventies, Akai was a mighty brand, catering for discerning buyers of tape recording equipment. In the cassette field, it wasn’t quite up in Nakamichi territory, but its top decks weren’t far off, and one look at Akai’s reel-to-reel offerings showed a company capable of superb quality at a surprisingly affordable price. This sums up the GX-625, which was a beautifully screwed together domestic machine capable of better sound quality than any vinyl-based source of the day. Of course, it was the 4000DS that put Akai’s name on the open reel map. Right throughout the nineteen seventies, this big budget box offered three speeds (maximum 7.5ips), three motors and three heads, (one being made from the company’s trademark hardwearing glass crystal) for under £200. It was great value for money, offering a sound that comfortably outperformed all but the very best cassette decks, and it soon found itself in the homes of musicians and audiophiles along. The former loved its ‘sound on sound’ facility, where they could bounce tracks whilst overdubbing, effectively letting them play along with themselves. The latter liked the big, open sound that gave extended frequency extremes that Compact Cassette users could only dream of. Still, the 4000 was a little crude to use, and certainly built down to a price. So for those who wanted an open reel experience more akin to studio tape recorders – albeit with the convenience of domestic designs – Akai offered the GX-625. It was a ‘middle high end machine’, close to Sony’s TC765 or Pioneer’s RT-909 in the scheme of things, but not scaling the dizzy heights of Technics’ RS-9900. It wasn’t cheap, at a whopping £600 in 1981 (five times that in today’s money), but its build showed where the money had gone. The head and transport block is beautifully engineered, making any cassette machine seem feeble by comparison. One erase head, plus glass crystal (GX) record and reply heads are set into massive metal housings. One vast AC servo motor drives the capstan, while two washing machine spec eddy current motors take care of the reel drives! The electronics are done to very high standard – not just the audio record/replay electronics which are unusually good for this era, but the slick logic controlled transport. Everything is very well engineered, even down to the teapot-sized mains transformer, explaining its 21kg weight. The result is a quoted frequency response of 30-26,000Hz (-3dB) at 7.5ips, 0.025% WRMS wow and flutter and 62dB signal to noise ratio. The only real criticism is the metering, which is definitely aimed at lazy home recordists; the ballistics are very slow and it’s best not to push the recording too far into the red. The Akai GX-625 sounds great for a machine of its vintage, clean and crisp and spacious, with lots of detail and punch. There’s always that tape-based warmth in the background; classic open reels can be as coloured as effects processors, so don’t expect crystalline digital clarity. But overall it turns in a lovely performance, one that’s head and shoulders about the 4000DS and knocking on the door of the big Technics, TEAC and Sony machines. I’ve just purchased an Akai 620. Do your comments, in general, apply to that machine too? Yes – the GX620 is virtually identical. Nice machine, have fun with it! Thanks. As you are clearly an expert at these things and I’m a reel(!) newbie, can I ask you another question? I plan to play tapes through a Yamaha 2200 sound bar – it has the appropriate phono lines – but I’m not sure how I’m going to record music onto the tapes. I don’t have a record player (or records for that matter), and I was wondering whether it was possible to ‘transfer’ music from my Apple devices to tape – though I can’t imagine how I would begin to go about doing that. Any thoughts? That’s grand, thank you. I confess I didn’t think it would be that simple…. You’re welcome. Let us know how you get on. Can I pick your brains on one other thing? I haven’t actually taken possession of it yet but I understand it doesn’t have an AC cable. Would you happen to know what sort of cable is required? Perhaps the three pin kind of thing we use for kettles…? Hello, is it possible to achieve sound on sound with the GX620/GX525? Thanks.